The only major facility on the fast road between Swindon and Gloucester, known locally as Hare Bushes service station. Inside the former Little Chef. The A417 Cirencester Bypass opened in 1997, causing the Little Chef restaurant in Cirencester on Crickdale Road to close. Meanwhile, the Highways Agency raised the issue of how few services the new road had. The site opened with a Little ChefHistory (there were plans for a sister site at M5 J11a but that one was never built). It was built with Cotswold stone brickwork around the restaurant and forecourt, and opened as a Little Chef Choices site with Caffè Ritazza and Harry Ramsden's menus. A Coffee Tempo! was later added too. In 2013 a Burger King was added to the site, and it received a thorough refurbishment although not quite to the standard of Wonderfully British. In January 2018 the Little Chef changed to use the temporary name EG Diner. This closed on 3 June 2018 with work expected to start to replace it with a Greggs, and to refurbish the Burger King however these refurbishment works commenced in late September 2018. 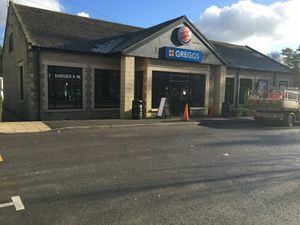 Greggs opened in November 2018 with the Burger King opening in December 2018. The forecourt was a Somerfield site, which became Texaco and now Co-op.